The Pilgrims established Plymouth Colony in what is now the town of Plymouth Massachusetts, but they first set foot on the New World at Provincetown when the Mayflower arrived offshore in November of 1620. For centuries before the English colonists arrived, Cape Cod was the home of the Wampanoag peoples. They lived off the land and sea, fishing and cultivating crops of beans, corn, and squash. These they shared with the colonists, helping them to survive their first winters in the new land. Guglielmo Marconi set up a telegraph post on the South Wellfleet beach in the early 1900s to communicate with England. It was this telegraph station that first received the report of the Titanic sinking in 1912. The beach here is still named Marconi Beach. Shipping of all sorts, from cargo to fishing and whaling, has always been important to the cape and surrounding areas. Thus you will find historic and picturesque lighthouse everywhere, marking all the dangerous navigation points. While Cape Cod is technically a peninsula, the Cape Cod Canal was cut through the low lying thin neck of land near the base of the cape connecting the tidal Manomet and Scusset Rivers and Buzzard's Bay in the south and Cape Code Bay in the north. The canal was first envisioned by Miles Standish of the Plymouth Colony in 1623, but was not ultimately built until 1923. The construction of the canal essentially made an island of the cape, cutting hours off ships' journeys between Boston to the north and Providence and New York City to the south. The Cape Cod Commission refers to it as an island, as does FEMA for purposes of disaster planning. Were it an actual island, it would be one of the largest barrier islands in the world. Most visitors travel across one of the vehicle bridges that span the canal, and move further onto the cape for their vacations. But the shores of the canal provide excellent recreation areas with bicycle and foot trails alongside the water. There are benches along the way, as well as several areas with picnic sites, playgrounds, and toilets. The two bridges can become clogged with traffic during the summer months, especially on weekends and holidays. There are also ferries running from Boston to Provincetown (non-vehicle), as well as ferries from the cape that service the islands of Martha's Vineyard and Nantucket. All along the 65-mile length of the cape are a number of historic towns and villages with charming bed and breakfast inns and mostly mid-sized hotels. There are a few resorts, but these are also mostly low key and mid-sized. Several of the areas are exclusive enclaves that are the summer retreats for the rich and famous - most notably at Hyannis Port, summer home of the Kennedy family and the summer White House when John F. Kennedy was President. This town (called P'town by residents and visitors alike) is one of the cape's most popular destinations for summer vacationers, who come primarily from around the greater Boston area. It sits in a sheltered harbor on the far tip of the cape. It can take several hours to drive from Boston, south to the bridge, and then all the way across the cape. For this reason, many people take the ferry from Boston. Most people who come to P'town stay in the immediate area and do not need vehicles (the ferry is for passengers only). There is also a municipal airport, with commercial flights from Boston, and car rentals are available at the airport and in town. There are plenty of hotels and bed and breakfasts, and the town is full of great restaurants, trendy boutiques, art galleries, and bars. 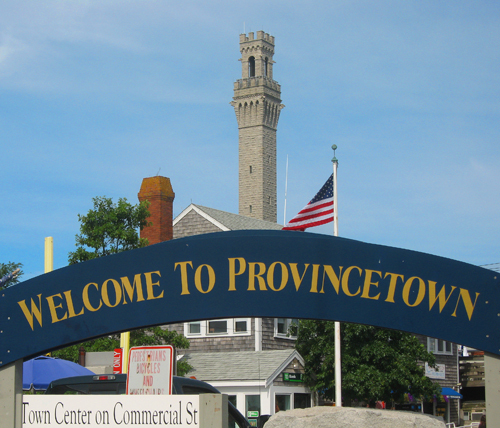 Not to mention its historic attractions such as the Pilgrim Monument and Provincetown Museum. It's known as a bit of a party town, and is a very popular destination with the gay and lesbian community. 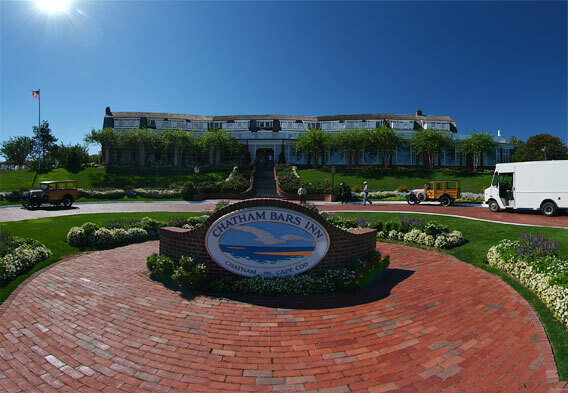 The town of Chatham (pronounced CHAT-um) sits on the "elbow" of the cape, due north of Nantucket Island. It's a lovely former fishing village, with a picturesque lighthouse (the Chatham Light), interesting museums, and a number of historic houses dating to the 18th and 19th centuries. This is an excellent walking town, and a stroll down its lively Main Street will reveal a number of traditional New England taverns, chic art galleries, antique stores, book shops, and crafts shops offering everything from fish rubbings to handmade silver jewelry. You'll even find charming bed and breakfast inns along the street. The cape boasts more than 550 miles of shoreline, and most of this is low-lying sandy beaches. 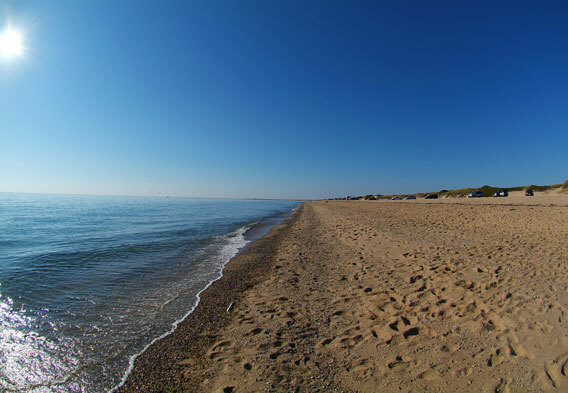 President John F. Kennedy signed a bill in 1961 creating the Cape Cod National Seashore, and because of this protected status, these are some of the most pristine beaches to be found anywhere in the world. In addition to the National Seashore, which stretches the entire length of the Atlantic coastline, there are many more beaches offering something for everyone - calm protected waters for children, good waves for surfers, sandy cliffs, and windswept dunes.